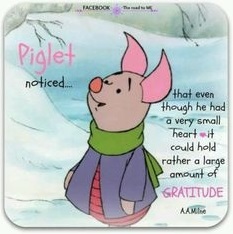 Who doesn’t love Winnie the Pooh’s friend, Piglet, and his perspective on life—especially this one where his small heart holds large amounts of Gratitude! What is your small heart full of—fear or gratitude? Fear of failure; fear of rejection; fear of tomorrow; fear of dreaming big; fear of losing someone; fear of being out of control…add your fears to the list. How is fear infecting your health? Medical professionals agree that fear can lead to depression, heart disease, high blood pressure and other health issues. Choose HOPE. Hope is expecting something good even in the bad. Finding hope in the ruins is a process of facing fears and choosing hope. Start by thanking God for those panic attacks, indigestion, anxiety and depression. Those things are not meant to harm you—but to alarm you. Through prayer, thank God for your built in alarm system. It’s not to harm you but to alarm you. Get honest with your fears and give them to God. Choose Hope – expect something good, even in the bad. God is always working for your good. Ask God to fill you with his peace, love and joy. Hope is a powerful thing and you can learn it by experience. May your heart of gratitude burst with hope and overflow on those around you. 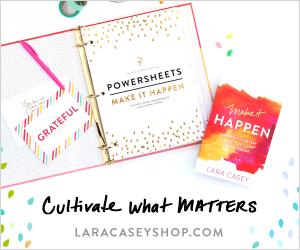 What is one area your life could change if your small heart held a large amount of gratitude?